Cárnica Batallé, a pork cuts specialist, confidently chose to do business with Mecalux again with the enabling of Movirack mobile pallet racks in its three frozen storage chambers of the Riudarenes (Girona) centre. 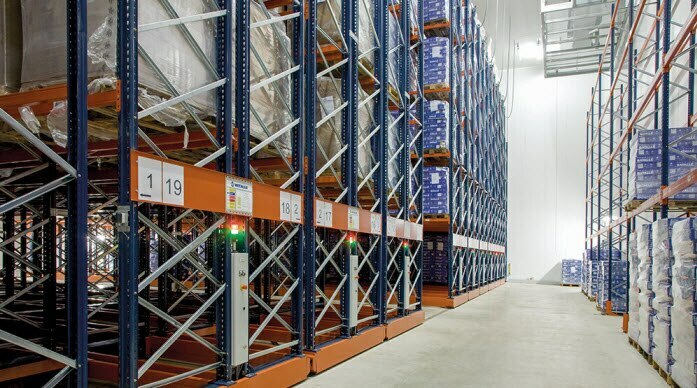 These 13 m high Movirack mobile racks, with a maximum of six load levels, will offer a storage capacity of more than 6,400 pallets. Each pallet is 1,000 x 1,200 mm in size and can weigh a maximum of 1,300 kg. Palletised goods can be of three different heights, adjusting to the logistical needs of the customer. This solution means Cárnica Batallé will improve efficiency and increase the storage capacity of its frozen storage installations, which run at a steady -20 ºC. Moreover, the company will cut energy consumption as Movirack units, being a high-density system, take up less volume maintained at sub-zero temperatures. This marks the second collaboration between Carnica Batalle and Mecalux. In 2009, they set up Movirack mobile pallet racks with a capacity of more than 3,900 pallets in this same Riudarenes warehouse. Grupo Batallé, which started doing business in 1920, is without a doubt one of the principal meat companies of Spain. Innovation and development in its production process let the company offer the highest quality products for general consumption.